Pat Keill Award - Website of commday! 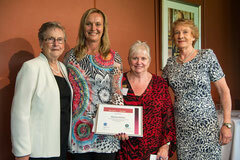 Prue Clarke, sister of the late Pat Keill OAM; Annie Kiefer,Vice President, Country Women's Association NSW and member of the Commonwealth Day Council; Janet Stewart, President, Commonwealth Day Council, NSW and Lauren Harvey, winner of the award for 2018. The Pat Keill Award has been established in honour of the late Pat Keill OAM. Pat was a great supported of the Country Women’s Association where she was General Secretary for over 30 years and also served on the Commonwealth Day Council and Director of the Australia Youth Trust for over 20 years.Sadly Pat passed away in April 2016. Her contribution to the community and in particular young people could not go unrecognised. Pat Keill had done. 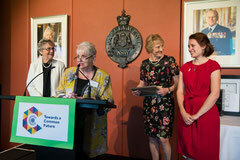 The recipients win a cheque for $2,000 and life membership from the Country Women's Association. The winner for 2018 was Lauren Harvey who was an intern for the United Nations High Commissioner for Refugees. She has also been a Social Media Coordinator for White Ribbon Australia where she is now their Schools Program Officer. Lauren has also worked with the Country Information Section of the Humanitarian Branch of the Department of Immigration and Border Protection in Canberra. She constantly works for the improvement and education of women and children,. She is the founding President of the Young National Council for Women, NSW. Martina Fletcher was the inaugural recipient of the Pat Keill Award in 2017. Martina has taken on the responsibility of mentoring new staff in her section at Bankstown City Council including a new female first year apprentice electrician. She has inspired women and female students in the local community to be whatever they want to be in life and that certainly includes working in an environment that may be dominated by men. She is leading by example and has and still gives freely of her time to guide, encourage and inspire other women. Janet Stewart, President, Commonwealth Day Council.